After my rainy climb of Mount Ibuki, I hopped a train to Kyoto, and then an hour south to Nara Prefecture (the home of the ancient capital city of Nara, but also many even more ancient historical sites – as well as mountains). The following morning, I traveled even farther south, to Dorogawa Onsen (an onsen is a Japanese hot spring resort) and Omine-san, one of Japan’s most sacred peaks. It remains so sacred, in fact, that women are not allowed to climb it. This morning, I braved the rain in Nagahama (just north of Kyoto) to attempt a climb of my ninth hyakumeizan, Ibukiyama (Mount Ibuki: 伊吹山). At 1,377 meters, Ibukiyama is the highest mountain in Shiga Prefecture, and one of four hyakumeizan in the Kanto region. 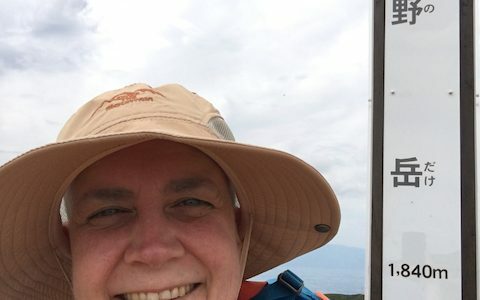 The climb started inauspiciously – with pouring rain – and my first sight of the mountain towering high above the surrounding plain gave me more than a little pause. Even so, I was already on the bus to the trailhead, and my research suggested the mountain would not be too difficult to climb in the rain.